He ran for the highest office in the land on a platform that excoriated the corporate “one-percenters,” promising to reign them in with reams of regulation and government-imposed price controls. To atone for all the alleged unfairness of “capitalist society” he promised explosive growth of welfare statism, complete with “free” education, free health care, free housing, and a virtual “economic bill of rights” filled with free everything. Good old fashioned socialism, in other words. Or, government-as-Santa-Claus. I speak of course of Hugo Chavez, the late democratic socialist ruler of Venezuela and his handpicked successor, former bus driver Nicolas Maduro. Together, these two men managed to completely destroy their nation’s economy with a mere fifteen years of democratic socialism. In textbook fashion, Venezuela’s democratic socialists used their nation’s vast oil riches to buy votes from the peasantry with free housing and all sorts of other goodies. They nationalized the oil industry and all medium- and large-scale businesses and made it illegal for the remaining private businesses to set their own prices. To make themselves appear even more popular they imposed universal price controls with such absurdities as two-cents-a-gallon gas. Predictably, the demand for all these nearly-free goods skyrocketed while supplies quickly disappeared since it was no longer possible to make a profit at such low, government-mandated prices. No one in his right mind would invest in the Venezuelan economy. In the absence of market prices and of the profit-and-loss market feedback mechanism in all those nationalized industries, economic chaos, and impoverishment immediately ensued. Dozens of major industries were placed in the hands of political cronies instead of people who actually knew how to operate them, leading to their rapid destruction, a hallmark policy of Latin American politicians. 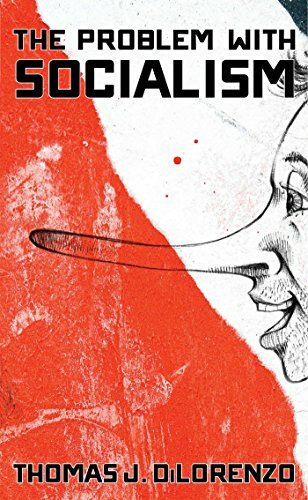 The Problem with Socia... Thomas DiLorenzo Best Price: $13.78 Buy New $11.68 (as of 08:35 EDT - Details) For years now, there have been shortages of everything in Venezuela, as hundreds of thousands of people have fled the country desperately looking for food. People who used to have good middle-class jobs have been literally rummaging through garbage in the streets searching for anything that is edible. Pets are starving to death, as are animals in the zoos. People are “hunting” cats and dogs and pigeons for food. The shortages of everything are most catastrophic in the hospitals, where babies and the elderly have died by the thousands because of the complete lack of simple medicines like antibiotics. Surgeons go without soap, antibiotics, electric power, gloves, and x-rays, according to a May 18 article in the Daily Mail. The article describes how patients languish in hospitals with days-old blood on their bodies; some lie curled up on dirty floors, “blood streaming, limbs blackening”; sick children lie in dirty cardboard boxes in hallways without food, water or medicine; rampant opossums killed seventeen newborns in one Venezuelan hospital; there is no medicine for chemotherapy; seven babies died in one day at a hospital because of the absence of oxygen tanks; malaria has made a big comeback; and much, much worse. In the face of these realities of socialized medicine, Nicolas Maduro recently proclaimed that: “I doubt that anywhere in the world, except in Cuba, there exists a better health care system than this one” in Venezuela. Power outages are routine in Venezuela, as are food riots. Meanwhile, the politically-connected live very lavishly, having rigged the system for themselves and literally stolen billions of dollars from the public treasury. The wealthiest person in Venezuela is the thirty-five-year-old daughter of the late Hugo Chavez, who is reportedly worth $4.5 billion. She got that wealthy the Clinton way: Without producing and selling a single product or service. Price inflation in Venezuela stands at 720% this year according to the IMF, which projects 2,200% hyperinflation for 2017. 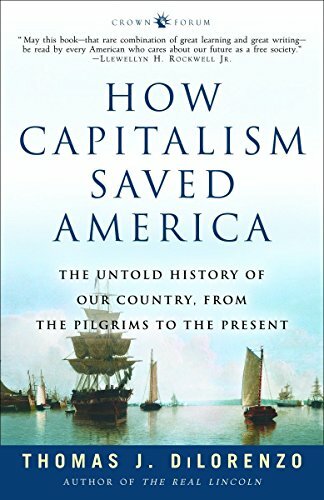 How Capitalism Saved A... Thomas J. Dilorenzo Best Price: $1.81 Buy New $6.08 (as of 03:45 EDT - Details) The Venezuelan government has done what all socialist governments eventually do, and has tried to create “prosperity” with legalized counterfeiting, a.k.a., “quantitative easing” through central bank “monetary policy.” Thanks to all of this quantitative easing an order of french fries at McDonald’s costs the equivalent of $130. The new head of Venezuela’s central bank recently announced that the mass printing of currency has nothing to do with inflation, which he blames entirely on “corporate greed” and, of course, a CIA conspiracy. In addition to creating hyperinflation, Venezuela’s democratic socialist government has dealt with the economic disaster it has created by issuing a “decree” that all adults must work for 60 days on a farm in order to avert a starvation crisis. Forced labor, Soviet gulag style. Castro and Stalin would be so proud of their Venezuelan protégés. There are reports that some people are so desperate that they have sold their children into adoption. It is little wonder, then, why Bernie Sanders, America’s pied piper of Santa Claus economics, was dead silent for the first time in years when he was asked by a Univision journalist last summer if he had an opinion on Venezuela’s economic and societal implosion. “No comment,” he said, explaining that he was too busy running for president in order to bring Latin-American-style democratic socialism to North America.